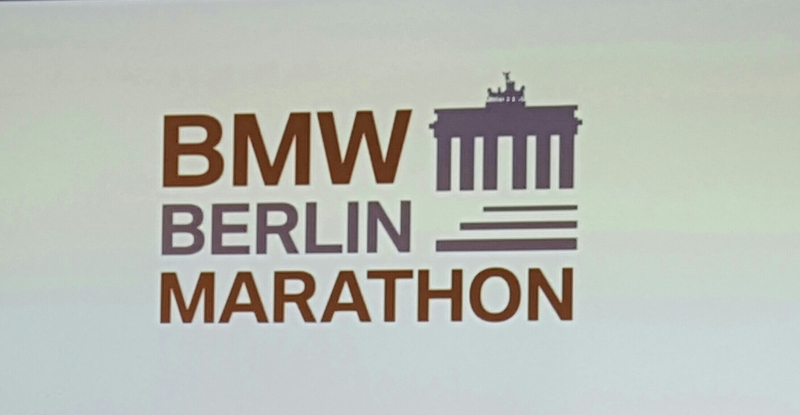 Flat, fast, unforgettable…the strap line for the 2015 BMW Berlin Marathon and I’ve got to say, I completely agree! Whilst the event was everything it is billed up to be, I do have mixed emotions about my performance. My initial aim for the race was to run under 2.31 to gain the Olympic qualifying standard. But I knew that on a good day I could run low 2.28 and on a really good day even go 2.27. The final few weeks of training after returning from Font Romeu had went really well. I ran a 10k PB at Teespride then finished 4th at GNR recording a very controlled 72.08. GNR gave me a chance to practice race day drinks which I’m really glad I did as the gel I took at 9miles really messed my stomach up so I knew not to use that one in Berlin. I did some lactate tests in the lab the Wednesday after GNR and got some very pleasing results. In fact they were so good that I didn’t quite believe them! But they confirmed what I already thought, that I was in great shape both physically and mentally and with the magical powers of the Berlin course I knew I could run fast. A lot of people say that one of the hardest parts of marathon running is actually getting to the startline in one piece. I managed that. But then again I also managed that 14months earlier in Glasgow and we all know how that ended. This was my first marathon since then so it added an extra obstacle to overcome in trying to forget what happened that day and not let it play on my mind and effect my performance. In the days leading up to the race the nerves were starting to build to a point where I was feeling physically sick just thinking about it. The few people that I disclosed this to reassured me that this was a good thing as it showed it meant something to me. I just had to try and control those nerves and then use them to my advantage come race day. Quite unusually I slept really well the night prior to the race and woke up feeling good within myself. I was quite calm compared to the previous few days and I even managed to eat breakfast without forcing it down. Though I have to admit that eating a beetroot flapjack at 5am was a bit of a struggle!! We arrived at the start area about 75 minutes before the gun went and stepping off the bus right in front of the start gantry I got shivers down my spine and actually felt quite emotional. I calmed myself and sat listening to some music until it was time for a warm up jog. Before I knew it we were being ushered on onto the start area. A few strides, well wishes and hugs with fellow Brits and we were on the start line. This was the first time I’d been in such a big mixed field so it felt strange having so many people around me all jostling for position. 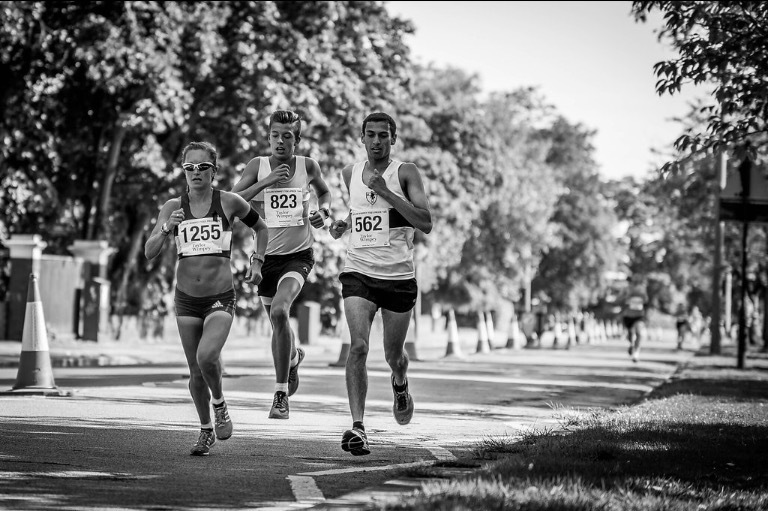 No organised pacemakers had been provided by the organisers. Most of the elite girls had brought their own personal pacemakers but unfortunately I’m not even fortunate enough to have a training partner never mind a pacemaker who could help me out – note to self advertise a “vacancy” on social media! I had chatted to a British guy via Facebook the day before to try and set something up as he was looking for a similar time but we never found each other in the crowd so I just stowed away in a group containing fellow Brit, and North Easterner, Sonia Samuels and a few other girls. Sonia had her husband helping her out and the other girls all had pacers so it meant that the group had plenty of men to take the work for us. Despite the first KM being about 6 seconds faster than I had planned I settled in and got carried along and was feeling awesome. The only bad thought I had in the first 33km was about 400m into the race when I suddenly thought “sh*t, I didn’t change my shoes” and had to actually look down at my feet to check that I had. Thankfully I had and I have no idea why I even thought I hadn’t!! Apart from that first KM I only checked my watch at 5k intervals. I knew what times I needed for each section to hit 2.28 and we were consistently 10-15 seconds under at each segment. I was cruising, feeling awesome and going through halfway in 73.33 feeling really strong, I started thinking about negative splits and the possibility of sub 2.27. Approaching 20k I had noticed my stomach starting to churn a little so I was debating about whether or not to take my drink at the 20k station. However, when I got to the station I had the decision made for me as my bottle wasn’t there. I didn’t panic though, I just got on with it and concentrated on moving forward. The miles ticked away and I was still feeling great. The next few drink stations were slightly less chaotic and thankfully all my bottles were there as I was starting to need them. I had drifted to the front of the pack and was pushing the pace on. When I say that, the effort was increasing but the actual pace was remaining the same. Miles 18 and 19 slowed slightly but we were still that 15 seconds inside 2.28 pace for the 30k split. By now we were catching quite a large group in front of us. I realised that this group contained Anna Haner, the top German woman. We caught the group and went straight past them. Looking back at the splits after the race I wasn’t too surprised to see that this mile was covered in 5.28 as by the time we got to 33k I was starting to detach very slightly from the pack. I was urging myself to get back on the back of them but my legs couldn’t respond. By now my stomach had began to churn again and was started to cause concern. I could feel myself slowing and took a glance at my watch to see a 5.55 split. I knew I couldn’t afford to drop too much over the final 9k. By 35k Sonia had caught me. This was a blessing in disguise as it gave me a kick up the bum! I latched on to her and managed to rally round and pull back down to target pace. Unfortunately though this was short lived and by 37k I was entering a deep dark pain cave! My stomach was really badly churning now and at times I was very worried that it wasn’t going to hold out! I tried as best I could to pick the pace up again but every time I did the cramps in my stomach were agony. I was going deeper into the pain cave. A few friendly shouts in the last few KMs kept me pushing on and when I got to 41k I knew I had 5 minutes left to still get the sub 2.30 I desperately wanted. I gave myself a good talking too, put my head down and pushed on as hard as I could. Yes it hurt, yes I thought my stomach was going to give way, but I’d put far too much into this marathon to let it slip away. I had a dream in my heart pushing me on and I wasn’t giving up without a fight. Coming into the final straight and approaching the domineering structure of the Brandenburg Gate I knew I was home. Just over a minute left then the pain would fade. The crowds were amazing, willing you on every last step. I channeled my inner Usain Bolt and pushed for the line, finally crossing it hand in mouth once again, to see the clock still displaying 2.29!! Sonia came straight over to give me a hug. She had smashed it running a brilliant 2.28.04. We congratulated each other, posed for a few photos then I sprinted off in search for a toilet! Once I was more comfortable I did the rounds on checking how all the other Brits had done. Along with myself and Sonia, Scott Overall also recorded an Olympic qualifier and Andy Davies ran a great PB. Unfortunately there was a few bad days at the office and Matty Hynes had to make the tough decision to DNF after an injury flared up at 30k. Speaking to other athletes back at the hotel, it was a lot of the same story. The last 5k was were it hit. 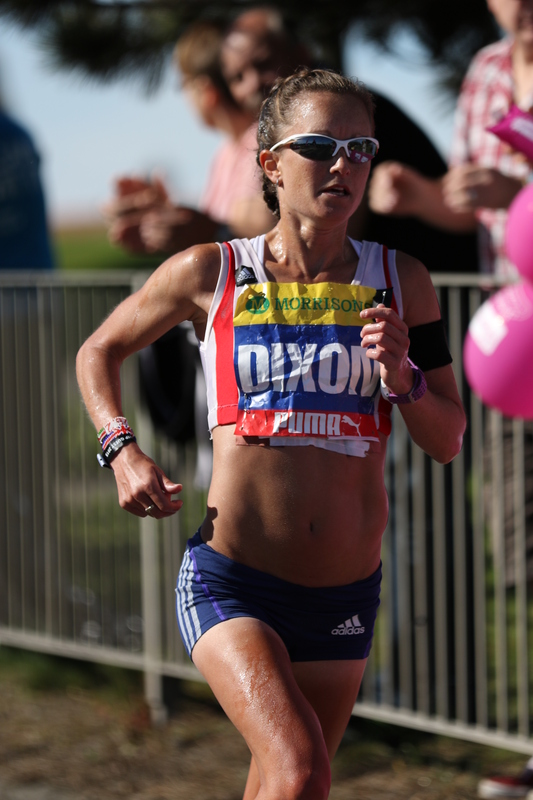 We all know that racing a marathon isn’t meant to be easy and when you are going into new territory like I did on Sunday, you expect it to hurt, especially in the closing stages. At the time I felt like I was dying on my feet and going backwards quicker than Lewis Hamilton in reverse but looking at my splits and seeing a video of me at 40k I was still moving well and was only running just outside 6 minute mileing so only actually dropped 30 seconds a mile over the last 3 miles. So yeah, there’s mixed emotions about my performance. Initially I was disappointed. I wasn’t quite sure if I was allowed to be disappointed with a sub 2.30 but I was as I knew I could go faster. On the other hand I was over the moon to run a PB, especially after the heart break of Glasgow and the emotional stress of the last few weeks. I’m also delighted to gain the Olympic qualifying time (2.31), however this doesn’t mean I’ve made the team, it just means I’m one step closer and now have a nervous few months waiting to see what others run. In an ideal world I don’t want to run a spring marathon so that I can prepare better for Rio (fingers crossed) but it may turn out that I have to in order to seal selection. But that’s something we’ll know better the beginning of next year. I’ll be honest, I’m gutted that I wasn’t first Brit, I wasn’t even first North East!! 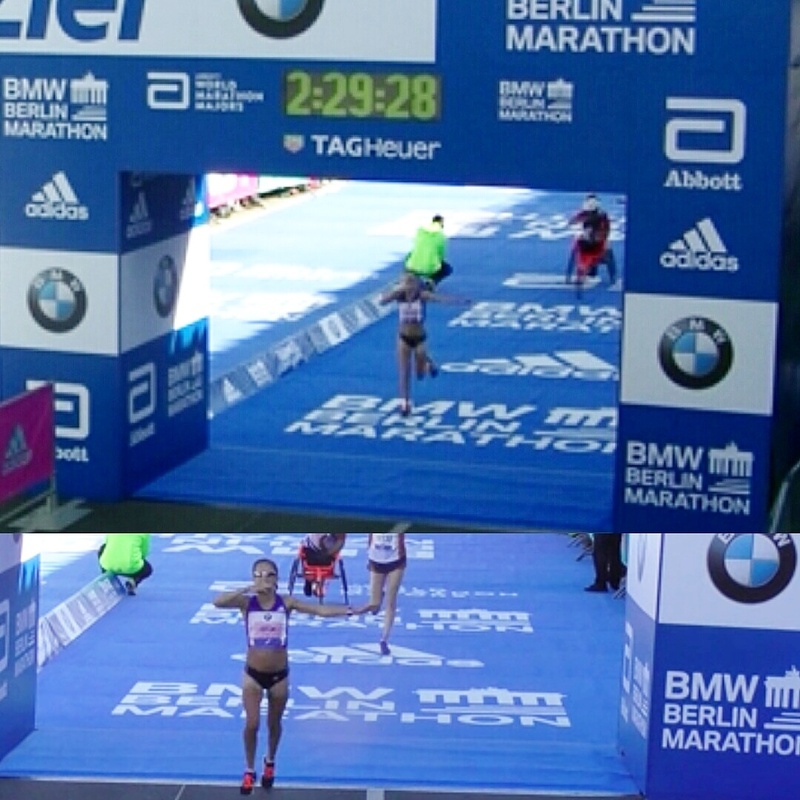 But Sonia deserved that run and I’m over the moon for her to run so quick. We’ve competed against each other since our early teens and it’s great to see two North East girls leading the way. The good thing is I know that there is room for improvement. I didn’t finish and think ‘I can’t possibly go any faster’ I KNOW I can go faster. I need to figure out what caused the stomach issues and get that sorted and that will save me a lot of time. I’ll wait a few days then I’ll evaluate my training to see if there are any changes I can make there. I think there is at least one change to make but I’ll keep that to myself until after I’ve looked at it fully. Other than that it’s time to rest, recover and enjoy some down time. 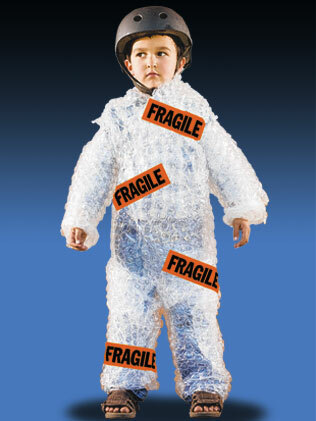 Apart from doing the monthly mile with my nephew Charlie next Tuesday, I’m not running a step for 2 weeks. The junk food binge has already started with a Macdonalds, chocolate orange and beer refueling strategy yesterday as well as dancing until 1am as my warm down, which seems to have worked as my legs weren’t too bad yesterday! Success isn’t a solo act and I’m a firm believer in always thanking those who help you achieve things as I couldn’t have done this without the help of a number of people, so MASSIVE THANK YOU to Julie, Paula, Renee, John and Adidas for all of their help and support in making sure I reached the start line in best possible shape physically, mentally, correctly fuelled and kitted out – at least my shoe insoles weren’t flapping in the wind!!! And of course, thanks to my family for their unconditional love and support. I know they are proud of me for what I’ve achieved so far. I actually feel sorry for my parents friends if I do make the team as they are going to have to put up with my dad going on about it and my mams work mates are going to have her nerves to deal with for the next 10 months! My mam was so nervous for me that she took herself out for a 2.5 hour walk on Sunday morning so that she couldn’t see any updates! After what our family has gone through the last few weeks it’s good to finally have something to smile about. Finally, thanks to everyone for following my blog and to everyone who has taken the time to send me messages of support. I wish I could reply to them all but my social media went crazy yesterday and I’m bound to have missed some. I can assure you though that I appreciate every message I receive. THANK YOU. 4 Responses to Berlin…where dreams come true! Looked for you in Sweatshop today – stupid really, way too soon! Wanted to say “fantastic job”! Thanks for coming looking for me but I’ve not worked at Sweatshop since March. Your blog has made fascinating reading over the last few months, and I was over the moon to hear how well you did. You’re a massive inspiration to me, and I’m sure to many others as well, thank you. You’ve done yourself and the North-East extremely proud. Enjoy your Maccy D’s and time off.